Each year, as we look ahead to the next draft class, we like to spend a morning putting the cap on the last draft class for the Cowboys. Last week, we spent significant time discussing how this team has been built, and that demonstrated again how the NFL is a young man's league where your roster is made of quite a few 1st and 2nd year players. This is especially true of a team that is over-leveraged with veterans who eat up the significant part of their salary cap. Sometimes the only way to make up the difference as you try to fill out your roster is to plug the holes with kids. Surely, that gives anyone indigestion who follows the draft and the NFL. It is one thing to point out who is available at a certain juncture of a draft, but it is another to see that you take a corner in round 5 and another player at the same position is a special player who appears to be an elite talent. Yes, all the other teams passed on him, too, but the Cowboys really, really need to not only nail their early picks - which they are doing much better than they used to - but also, make up some lost ground by finding those diamonds in the rough that they used to find back in the old days. And Richard Sherman is a player at the same position they targeted who then became a 1st Team All-Pro Player in his 2nd NFL season. Do you have any idea how that would have affected everything? They don't sign Carr then and have the $50 million for Carl Nicks, perhaps. If they could simply find something worth bragging about in the mid to late rounds then they might not always have more holes than plugs. Some years we have a good idea of what the Cowboys are looking to do on draft day and some years we clearly have no idea. 2012 was the latter of the two, because as draft day approached, the name Claiborne was not on the charts for many. In fact, if they did trade up, there was a pretty strong belief it would be at the safety position to go get Mark Barron or perhaps on the defensive line to get Fletcher Cox. But, the Cowboys moved up aggressively and sacrificed their 2nd rounder (a pick that would have landed another strong player - Peter Konz or Jerel Worthy were there - to go get the corner from LSU. It was a strong price to pay, but early indications seem to be that he might be the type of corner who can handle the expectation level. He played 909 snaps for the Cowboys in 2012 and seemed to show "ball hawk" attributes as one of those rare birds who can find the ball and take it from you whether it be in the form of interceptions or stripping fumbles. He happened to be the guy standing in the proper spot to recover fumbles, too, which helps a team who doesn't take the ball away enough. Called for 2 penalties in road games, but aggressive and physical on routes much of the year, Claiborne is a promising piece. His tackling on run plays is not his strength and the final game might have been one of his worst, but overall, the Cowboys can feel good about the player even if most of us regret the huge price they paid to get him. Crawford was another name upon his selection that made plenty of people rush to google to figure out who he was. He was sold early on as a guy who would force his way into the lineup and be able to turn some heads quickly with his burst at the snap and his potential ability to be the rare run-pass DE as opposed to the many DEs they have had who are either run or pass. The issues were that he was raw and needed significant development to put together an arsenal of pass rush moves that might prove to be his way to impact the league. Well, 303 snaps in his rookie season later, and we have yet to really have our jaws drop with his contributions. He seems to have that good news/bad news review in that we have not noticed him doing anything that says he is not capable of holding his own, but we have also not seen anything that has jumped off the screen positively yet, either. We assume the scheme change will suit him well, but given his use that was sparingly, this is likely a spot where we are still waiting into year 2 to define what exactly he can be. He is a useable rotation piece, but to promise anything beyond that is difficult to do. By the time you get 113 picks deep in any draft, you have to curb your expectation levels a bit for a player in his rookie season. Then, in the case of Wilber, who was injured in the spring and then again in August where he needed surgery to repair his thumb, we just don't know much about him a year later. He played on special teams, but as far as knowing his strengths and weaknesses as a linebacker and whether he might be a candidate for the SAM position in the new 4-3 is merely guesswork for us and for the Cowboys. Even with significant injuries everywhere but outside linebacker, we only saw 16 snaps for Wilber who they flirted with as an inside linebacker when all of those players fell to injury, but it did not take long for them to move in a guy like Ernie Sims instead. Wilber is a player who may have an upside that we are not fully aware of as we go back and review his work at Wake Forest again, but in 2012, it was a season that almost never got started for him - a theme you are about to see is one shared by many rookies. Health did not smile on the Cowboys rookie class. Wilber's grade must remain incomplete for now. There was no player the Cowboys added after Claiborne last spring that I was more excited about than when they added Johnson. In breaking down several games at Eastern Washington, it was clear he was a man amongst boys at a lower level of college football, but a guy who had instincts as a safety that very few Cowboys players at that position have had in a long time. But, the tractor never left the barn as all season we marveled at the fragility of his hamstrings. Those hamstrings have kept him away from public review for the entirety of training camp and the regular season. In a sport that values durability, this is obviously a disappointing summary of 2012 and one where we are now hesitant to put any expectation level on the kid in 2013 until he shows he can report for duty. Without any medical expertise, we shall simply acknowledge the confusion of why the Cowboys were so delayed to put him on the injured reserve, but in a position where they really seem to have very few plans, Johnson could reveal himself to be squarely in the mix moving forward. But, his 2012 was most disconcerting. Any time you cut a pick at the end of training camp, you certainly feel a strong level of disappointment, and that is exactly what happened with Coale. Coale was the 2nd consecutive 5th round pick of Dallas to be cut at the end of training camp and the 2nd highest pick of the 2012 draft not to make his team. He never was completely healthy in camp and then went to the practice squad when he was unclaimed. While playing for the practice squad in 2012, he tore his ACL in his knee and now appears to be a bit of a long-shot to ever do anything for the squad. At this point, but a footnote of the 2012 draft class. Unlike Coale, this is the most likely pick to be labeled the diamond in the rough of the draft. Hanna appears to have tremendous upside as a receiver and will now have nothing blocking him in the lineup. The team played him more in December then he played all year and he had moments of strong play and flashes of being a guy who will be difficult to cover in the secondary. In a league filling with mismatch tight ends who might be too fast for linebackers, yet to big for defensive backs, Hanna has a chance. With John Phillips no longer in the picture, there is reason for optimism, but his big question will be whether he is capable of run blocking, especially as a player lined up next to the tackle against the big boys in the box. That is his rap at this point having only played 109 snaps in 2012, mostly as a flexed tight end in the slot. When picking 222, you just want a guy who can come in and play special teams with great effort and abandon. Well, when Caleb McSurdy blew out his achilles heel, that didn't materialize and he is now no further down the road than he was when his name was called. He will be in the mix at training camp, but I am not sure I would expect too much from him and then anything received as a special teams contributor and a backup middle linebacking option will be an added bonus. Seemingly able to defy odds and help out in limited duty, his 128 snaps actually rank 3rd amongst the rookie class. He has something, although when a player this small does nothing on special teams, it is a problematic note in the battle for a roster spot. He has a chance to develop and will continue to get every opportunity to find a bigger role since the Cowboys have very little competition after Austin, Bryant, and Harris. There was a lot of optimism around Leary when they signed him to a virtually guaranteed deal out of Memphis when he went undrafted due to medical questions that will likely shorten his career. However, seeing his poor technique in training camp, it was clear he would require plenty of development to ultimately be in the picture. Lucky for him, depth at guard on this roster is not something to get excited about. He is in the picture heading into 2013 camp. The diminutive Dunbar was not considered to have much chance to make the Cowboys out of camp, but kept hanging around all season. Another player, like Beasley that is not much of a factor in special teams, but because he can do many things has survived a full year on the roster and was on the field for 91 snaps. We shall see where it goes from here, but the fact that we are still talking about him does say something. If Felix Jones is not back, it of course enhances his chances quite a bit to stay, although the Cowboys seem to need another RB as DeMarco Murray has not stayed healthy as a pro yet. Another local product who emerged on the roster was Bass. Just 26 snaps over 2 games was his full total and he might be a player hurt by the scheme change moving forward. But, as we head into camp, he will continue to try to show the ability to move players around on a defensive line with very few young prospects. Again, compared to the 2009 draft, 1500+ snaps is a strong start, but as you can see, there are many names on this list that never got out of the starting blocks. They are all still on this roster, but we hope to see some major strides moving forward. Not a horrible rookie class, but not nearly as strong as it might have been, so far. On Sunday, Brenden Morrow was traded to Pittsburgh, and in many ways a door was closed on a Stars era that was a lot of fun for many of us. Morrow was the last player connection to the Stars teams of greatness as he played on the 2000 Stanley Cup Finalist that fell finally to New Jersey at Reunion Arena when Jason Arnott beat Ed Belfour in Game 6 in overtime. He then grew up in front of our eyes and eventually ran through nearly the entire life-cycle of a player until he was dealt a few days ago as a reminder that the clock ticks for every man. It is very odd to realize how fast a player's career goes. It is something that never crossed my mind when I was younger, but now that I have been lucky enough to have covered the Stars for 15 seasons, I have managed to outlive everyone but Ralph and Razor it seems. These players have a short amount of time to be all that they can be down on the ice, and then in the blink of an eye, they go from being the kid in the room to the old man. Seldom do we see that entire life-cycle before our very eyes, but with Brenden Morrow, it seems that we saw most of it. Now, I think I speak for all of Dallas in wishing him the very best as he moves forward and attempts to put on a show this spring that will allow him to play several more years in the National Hockey League. If he does what he can do, he will set himself up for a 2nd act of his career that could be pretty special. But, from a Dallas standpoint, when his former team-mate and now general manager Joe Nieuwendyk pulled the trigger, it absolutely was the right move to make. They had another month on his contract at an amount that had no longer paid him the market value for his contributions. Players all have expiration dates, and for this job in this place, Morrow looked like a guy who had asked a lot of his body and couldn't give what he once could. He deserves full credit for rebuilding his value by getting his body right, because this trade would not have been available a year ago. The Stars did what they had to do, which is to take an expiring asset in which they may not have a desire to keep long-term and flip it for a young player with a chance of being something nice. In return, they take a 1st round pick from the 2011 draft in the form of Joe Morrow. If Joe Morrow gives them anything at the NHL level, it will be more than they would have received in return for Brenden when he was scheduled to leave in July. It was just good business for both parties. The Stars for securing a piece in return for an expiring contract, and Brenden for lifting his no-trade clause to play for the Stanley Cup and his next contract this spring in Pittsburgh. I like the move and I can't wait to watch Morrow go deep into the playoffs, while the Stars try to simply make the playoffs without him. But, they, unlike Pittsburgh, are in no position to "go for broke" this spring. They are playing for the big picture. And maybe Joe Morrow can be in that picture. We shall see. Meanwhile, as I reflect on turning the page on the Brenden Morrow book, it does allow one to enjoy some playoff memories - back to days when Morrow was a baby-faced bull in a china shop, earning his captaincy and playing meaningful hockey deep in the spring. He was a proper team leader who had his team follow him into battle. Brenden Morrow is my new hockey hero. He rises to the occasion like a captain should. He gets mad. He gets even. He plays like this is the only thing that matters to him. He is perfect for this role. To see him skate over to the Canucks bench on one leg, after that punk Burrows offered a cheap shot, was the stuff of legend - considering his Game 5 OT goal that kept the series moving. There can be no further questions about his capability to be this team’s captain. Seeing the video makes me want to watch this fantastic series again. The 2007 Canucks series was one in which the Stars dropped a Game 7 up in Canada (as Tom Hicks watched on a television from a Rangers game, as I recall). Both goalies were stars, but so was Brenden Morrow. Morrow had been given the "C" not too long before that time from mate and legend Mike Modano. There was question at that point whether that made any sense. And I think this was one of the moments that took that question away. 2. Morrow sends a hit at the end of regulation in 2008 Game 6 against the Sharks that rocks the Arena. Morrow’s hit on Milan Michalek was so thunderous that the arena exploded. But, when Michalek stayed down on the ice, it got quiet really fast. I have been unable to find any reports on his health this morning, but we sure hope he is fine. The impact of that hit was felt the rest of the night. From the Shark’s standpoint, they lost one of their best players. And from the Stars’ side, it seemed like the captain making a statement that the Stars were not going to be denied. And then there is the captain. O Captain, Our Captain. What in the heck could you say about Brenden Morrow? Somehow, he was credited with 19 hits. Somehow, he never looked tired. And somehow, Morrow put the game out of its misery at 1:24am. And for the second consecutive Game 6, the pure joy on the battered face of the Stars’ captain shows that the paychecks are nice – but you can’t buy the feeling of winning in the playoffs. Razor was comparing his performance in these playoffs to Mark Messier’s legendary runs. I will defer to Razor since they were mates back in the day, but allow me to say I have never seen anyone will his team to a new level like Brenden is right now. I would call that the single biggest goal scored since Belfour, Hitchcock, and company did their thing back in the golden era. Morrow was front and center and put the Sharks to the sword. It is tough to see a player lose a little of their ability and then to say goodbye altogether. I think everyone wants to see him rally in a big spot now that he has moved on. He will always have his place in Dallas hockey lore and was an absolute fantastic captain who did everything asked of him while squeezing everything he could out of his abilities. In doing so, he has put the bar nice and high for whoever succeeds him as captain of the Dallas Stars. Good luck, Mini-Mo. And thanks for all you did. Rafael Vela runs Cowboys Nation and just released his new mock draft here. David Newbury serves a number of roles at Sportsradio 1310 The Ticket and can be followed on Twitter here. Time to get serious here with that NFL Draft now just 35 days away. It is a chance for the Cowboys to really add some pieces that can make a difference. Of course, this will require some special selections in their top 3 chances, and I wanted to assemble a couple of my Cowboys friends to take a look at which way the wind is blowing - especially on pick #18. Rafael Vela: The good news as I see things is that the draft breakdown may put the best interior offensive line prospects and the best pure right tackle in Dallas' reach when the 18th overall picks rolls around. The question, as it has been for quite some time, is whether Jerry Jones will green light such a pick? I have a feeling he might just do so, if my breakdowns are correct. Two years ago we heard that the Cowboys would not take an offensive tackle with the 9th overall pick, and that the team would not spend such a high pick on a player slated to be a right tackle. Yet, the Cowboys selected Tyron Smith and he's now the anchor of their line. We've all heard the Cowboys covet 3-technique defensive tackles to spark the interior rush in their new Monte Kiffin-run 4-3. This draft offers a trio of intriging prospects at that spot. It appears, however, that Sharrif Floyd, Star Lotulelei and Sheldon Richardson will be gone well before Dallas' pick. To my eyes, this makes the draw a four-player race. Texas safety Kenny Vaccaro heads the list of realistic defensive targets. If Dallas can land him, and he's anywhere close to his fellow Longhorn Earl Thomas has been for Seattle, the Cowboys will finally suture the gaping wound at free safety which opened when Darren Woodson retired. The other three options -- guards Chance Warmack and Jonathan Cooper and right tackle D.J. Fluker would upgrade one of the offensive line spots. The question is how those four stack up? In many ways, this draft resembles 2010, when the Cowboys had a short list of guard Mike Iupati, the safety Thomas and eventual pick Dez Bryant. Dallas' draft board leaked that season and those three ranked 10th, 11th and 12th respectively. On draft day, I learned Dallas was trying hard to get Thomas, whom they felt would go highest. Why not Iupati, who was rated one spot higher? I've been told that when players are cheek to jowl on the board, having near identical grades, the Cowboys will go for the bigger need or the higher impact position, and safety is a priority position over guard. I think we could see similar thinking here. If Vaccaro is anywhere close to the others, I think he's the one Dallas will covet the most. If he's gone, if a team like the Rams or the Steelers take him just ahead of the Cowboys, how do the offensive linemen rate? Again position will dictate the pick. If Fluker is close in grade to the guards I think he'll get the nod. If a Warmack and Fluker are there, and the guard is much higher, say Warmack is 10th and Fluker 18th, Dallas won't push it's board. Warmack would get the nod. What would be the choice of Warmack and Cooper? Again, the board will tell, and on March 21st, I'm not sure the Cowboys know. I doubt they're put their final board together yet. Bob Sturm: I like these scenarios, although Vaccaro has not passed all of my tests. I want to study more Texas games and really zero in on his role, but what I have watched so far is a mixture of high-end plays and missed tackles. Of course, when you are on a poor tackling defense, it is easy to see where one might over-commit to attempting to cover for others and we know at safety this can cause more and more issues. I don't deny that they desperately need a high-end safety, but my two responses on that front are back to my belief that the Cowboys need to invest in their big boys (OL and DL) again and again to compensate for years of neglect and also my uncertainty of Vaccaro being elite. Earl Thomas jumped off the screen and seemed elite from his college film. Vaccaro doesn't seem on that level, but he would instantly be the best thing the Cowboys have had in here in years. David Newbury: If the 2012 injury plagued season didn’t teach Jerry Jones that the NFL is a battle of attrition then nothing will. I fully expect Dallas to address their depth problem and strongly consider trading down this April. The Cowboys have holes at offensive line, defensive line, safety, running back, tight end, and wide receiver. You could argue that they need two offensive linemen and defensive linemen. Unfortunately, the Cowboys have more holes than draft picks. There have been 16 different playoff teams over the last two years. Since 2007 those playoff teams have averaged 20 picks in the first 3 rounds of the draft. That’s 20 first, second and third round picks. Since 2007 the Cowboys have drafted 14 players in the first, second, and third round. Let me put it a different way. Playoff teams add 3.3 players drafted in the top 100 to their roster each year. Dallas adds 2.3. The Cowboys have hit on a lot of their draft picks since 2010. The problem is they haven’t had enough draft picks. Dallas has added Dez Bryant, Sean Lee, Tyron Smith, Bruce Carter, DeMarco Murray, Dwayne Harris, Tyrone Crawford and Morris Claiborne since 2010. That’s a very solid core! Unfortunately, Dallas sacrificed a 2nd, 3rd, and a 4thround pick to put that core together. The one thing Dallas can’t do this year is trade up. I still hate the Mo Claiborne trade. I love the player, but hate the trade. The 2013 draft lacks the elite players that the 2012 draft had. The 2013 draft does have incredible depth. This could be the deepest draft the NFL’s had in 10 years. Dallas must take advantage of this opportunity. Jerry must resist the temptation to trade up. This is the year that Dallas can find a starter in the 3rd or 4th round. So what is Dallas going to do with the 18th pick? I think there are 8 “special players” in this draft that Dallas can’t trade away from. These 8 players also fill a need for Dallas. They are Luke Joeckel, Eric Fisher, Lane Johnson, Jonathan Cooper, Chance Warmack, Sharrif Floyd, Star Lotulelei and Sheldon Richardson. I think the 3 left tackles will be long gone before Dallas’ selection. Dallas would love for OU’s Lane Johnson to fall to them, but I don’t think he gets passed San Diego at 11. They would love to have 1 of the 3 defensive tackles. Shariff Floyd, and Star Lotulelei are top 10 picks. Sheldon Richardson has the best chance of the 3 to make it to Dallas, but I have him going 14 to Carolina. That leaves the 2 guards. I like Cooper more than Warmack. Either would be a day one starter. I like Cooper because he is more versatile. He can play center in addition to guard. Warmack is a guard only. Cooper is also more athletic and will allow the offense to do more. Remember last year when we were all screaming for Dallas to run more screen passes? Dallas couldn’t because their offensive line wasn’t athletic enough. Drafting Cooper would add a nice wrinkle to the Cowboys offense. Warmack would bring an element of toughness that the Cowboys offensive line hasn’t seen since Larry Allen. He is battled tested. He is the guy you run behind on 3rd and1 with the game on the line. Dallas passed on David DeCastro last year because they thought they solved their offensive line problem in free agency. Dallas can’t make the same mistake twice. Dallas needs to sprint to the podium if one of these two special players fall to them at 18. What happens if all 8 of the “special players” are gone? Kenny Vaccaro is an option. He is a great safety! Like guard, Dallas has ignored the safety position for year. I am a big fan of Vaccaro’s. I would have no problem if Dallas drafted him at 18. However, I wouldn’t take him at 18. Some draft analyst are saying that this is the deepest safety class they’ve ever seen. I would much rather take my chances with Matt Elam, Jonathan Cyprien, Eric Reid, Phillip Thomas, D.J. Swearinger, Shamarko Thomas or J.J. Wilcox. I would trade back and collect an extra top 100 pick. We all get scared when we think about Jerry Jones trading down. It’s the right thing to do this year. This team needs depth. I leave you with this note about the Cowboys’ drafts from 2006-2009, a span of 4 drafts. Dallas made 34 selections from 06-09: 16 are out of the NFL, 14 are on other teams, and 4 remain on the roster. There have been 16 different playoff teams over the last two years. Since 2007 those playoff teams have averaged 20 picks in the first 3 rounds of the draft. That’s 20 first, second and third round picks. Since 2007 the Cowboys have drafted 14 players in the first, second, and third round. Let me put it a different way. Playoff teams add 3.3 players drafted in the top 100 to their roster each year. Dallas adds 2.3. That is a staggering number. It shows the price and the penalty of constantly trading up to get what you want. This isn't fantasy sports where you mortgage your farm to get the player you want. The best franchises almost always have attributes of patience and restraint when they are doing business in free agency or the draft. They don't fall in love with one particular player, because you cannot control what the other 31 teams might do. You simply nod and take your next guy and trust your process. But, in Dallas, especially in the cases of Felix Jones, Mike Jenkins, Dez Bryant, Sean Lee, and Morris Claiborne, it appears they fell in love with a particular player and had to get him. In 4 of those 5 cases, they traded up to get them. If you hit, then you say it is worth it. But, if they never are offered a 2nd contract, you multiply your problems. Meanwhile, this Jonathan Cooper vs Chance Warmack discussion is interesting to me. Both look sensational and would instantly upgrade things. But, position versatility to me is not as important as it is to David, I think. I want a guy who can plug other holes if possible, but when I am taking my cornerstone players (and 1st rounder should be a plug-and-play) then I am not worried about his ability as a utility tool. I do concede that Cooper is a force in space, but I really like Warmack's build that although a bit "belly-heavy" appears to make him nearly immovable. When you have a center next to him who appears to be quite movable in Phil Costa, then I think they compliment each-other well. On the other hand, perhaps I am contradicting myself when I consider Costa's ability to break my tie if I am going to discount position versatility from David's evaluation. Overall, I am just tired of the Cowboys being pushed around. Neither looks like a candidate for that, but Warmack looks most like a San Francisco 49ers guard who might push people around without mercy for 3 hours. I want to draft a bully. And that is why Warmack appeals to me more than Cooper. But, trust me, if Cooper or Warmack are selected in the 1st round, it will get a virtual fist pump from this space - where we have been asking them to attend to their needy offensive line for years and years. Thanks, guys, for your thoughts. We will do this again soon. There was a little communication this week between the brass of the Dallas Cowboys and the beat writers who gather for every word, and Clarence Hill of the Fort Worth Star Telegram found something worth discussing in his conversation with Jason Garrett on Wednesday from the NFL Owners Meetings in Arizona. As he prepares for his third draft class, Garrett says his program is firmly in place with his type of guys and 2013 is a big year to take the next step. Only 16 players, including just seven starters, are left on the roster from the team that Garrett took over in 2010. "I think we’ve done a good job over the last couple years, like we talked earlier, transitioning our roster from a lot of older players to some younger players, still keep ourselves in competitive situations at the end of the year, having a chance to compete for the division," Garrett said. "We brought in some young players who can be the cornerstones for us going forward to add to the Tony Romos, the DeMarcus Wares, the Jason Ratliffs, Jason Wittens, those guys who have been big, significant players for us in the past. Now you think about Sean Lee, Bruce Carter, Dez Bryant, Tyron Smith, DeMarco Murray, all those guys. “The identity we’ve established together gives us a chance going forward." This is a topic worth visiting about that I am happy the coach brought up. Listed below is a chart that will show you with relative clarity how the Cowboys were built and you will see that the majority of the roster has been put in place since Jason Garrett took over the team in November of 2010. Even though he has had just 2 drafts, 29 of the 47 players who have made this roster can be traced back to Garrett. Hill writes that only 16 remain - I count 18 - but, the point is the same. This is mostly Garrett's team from a quantity standpoint. The question continues whether or not it can be said that from a quality standpoint. Are the 29 names listed in grey in 2011 and 2012 players that are carrying most of the weight on this team? Or, do we still look at 2003-2006 as containing most of the quality back when Bill Parcells roamed the halls of Valley Ranch? And, of course, listen in blue from 2007-2010, the Wade Phillips/Jerry Jones war-room that we would all like to forget about for the most part - save that 2010 when Dez Bryant and Sean Lee salvaged an entire era with their acquisitions. Currently, there are way more names on their active roster than 47, but I only list the names who have proven they have made a roster at some point here. Most of these players have at least worn a jersey for one game or in Ron Leary's case been basically guaranteed a roster spot with his contract. We should also note that there are a few more players lingering out there that could be re-signed (Felix Jones) that would help prop up 2008 and he would still be considered a continuous service Cowboy. But, I am not holding my breath that he is in their plans. It is also interesting to see what a small effect that free agency has had on this team. They do have the reputation of not "growing through the draft", but as you can clearly see, this team is built almost 100% through the draft - and undrafted free agents signed every April - except for the players they have brought in during 2012. This team - for better or for worse - is home grown for the most part. They are primarily players who have never played for another team and have been here long term. In fact, as you look at it, the most disconcerting element is the fingerprint that Parcells still leaves 7 seasons after he has left. Only now, after the 2011 and 2012 seasons of Bryant and Lee can we say that Parcells didn't put the entire "best 5" Cowboys on this roster. Garrett has tried carefully to find the "right kind of player" who understands all of those character traits that he believes are part of building a team properly. He has pushed for them to target players who were captains on their college teams or have held other leadership positions. And the jury is obviously out on whether this has dramatically changed the fabric of the organization. Why? Because, in the end, it comes down to whether they are able to win games, divisions, playoff games, and hopefully, a Super Bowl. You can have the best leaders in the NFL, but they better be able to block and tackle on their way to leading. And that has been the rub here. But, if we can understand that it is tough to turn a program around in the blink of an eye, we must at least consider the fact that there is a bigger picture to consider here. Are we seeing slow growth and youth development going on underneath the surface of conversations of play-calling and Romo's future? Is there something being built as Garrett references? One would hope so. Garrett has a hand in what is going on and a plan for how to get there. Of course, so has - we hope - every coach who has ever taken over a team at the professional level in any sport. The trick is to hang around long enough to see it through. And that is the question for any owner running any team. To figure out if their coach is on to something awesome that requires 5 years or if they are just wasting resources for this guy to figure it all out. Is this Bill Belichick in Cleveland? Jerry admits he should have given Chan Gailey longer to sort through a very complicated situation when he took over the 1998 Cowboys. Or is this Dave Campo or Wade Phillips? Because some coaches are miscast as architects who have a global vision. You can wait 15 years and it might only be getting worse. I think most people agree that tangible results need to happen this year for Garrett to feel safe about coaching in 2014 here. There is plenty of pressure and not a ton of patience for this upcoming season and it all starts with getting this draft right. And perhaps that will be his calling card. Looking at the chart, it seems that if anything can be considered a clear upgrade since Garrett's arrival, it seems that potentially, the process in the draft room has clearly exceeded his predecessor. Is that more of a praise of Garrett/Jones or underscoring the poor job done by Jones/Wade? Fair question. And as we look at Garrett's challenges, is one of them that is not discussed enough trying to pull this thing out of the personnel ditch that Wade/Jerry had put them in? If DeMarco Murray, Bruce Carter, Dwayne Harris continue to develop, Tyron Smith and Mo Claiborne continue on their road to being long-term building blocks, and we see much of the 2012 draft class emerge, maybe this slow-build technique will have long-term results. The question is whether Garrett will be here to enjoy it or whether the next guy will see that maybe the cupboard is not that bare. Regardless, I thought it might help to see just when and how everyone on the roster has arrived. This didn't happen overnight and the fix won't happen quickly either. But, Garrett now feels like his team is in place. Let's see what that means on the field in 2013. April 3 is the NHL Trade Deadline in this oddly constructed 2013 NHL Season. That gives us 15 days to look at options for the Stars to consider as they head down the road of trying to get from where they are to where they wish to go. And at times, they seem a long ways from where they hope to go. And given that in the last 5 games, they have pulled 3 points out of 10, it might be time for the suits in the front office to take a hard look at the alternative plan. Nobody likes to ever consider the alternative plan until reality hits them right in the face. When you start each season, you bravely announce that the playoffs are the goal (or the Stanley Cup for the extra-brave) and you march into the year filling your fans' heads with optimism and hope. Then, when things start to go badly, a team must make that tough decision. The players and coach don't need to be involved in this tough decision, because you want them playing as hard and trying to win their next game no matter what. There is a belief amongst fans that there is a time to "tank" and try to work your way up the draft ladder by design (Hello: Seth Jones), but that is a very dangerous proposition of inviting cancer into your organization (losing, not Jones) by authorizing a mentality where anything less than winning is welcomed. This is fun talk for message boards but I don't believe for a second that most of the proud men in sports would ever consider trying to lose just for a few draft spots. That is everything opposite of the wiring of these men who ascend to this level of their profession. They get indigestion from losing a game and to lay down and surrender when people are paying money to follow your team is the unpardonable sin. Some fans call it good business, but few men inside the lines would agree an even fewer would participate. Anyway, back to the tough decision. When a team gets to a certain fork in the road, it has to make a choice. Are we in this race or aren't we? What is our highest upside of achievement in this year and where can we help the big picture if we sacrifice this year's upside for the future? In other words, can we flip some of our assets to give this thing a boost moving forward and making next year or the year after a more likely target? Fans and media often don't want to hear about playing the long game, because we want payoff sooner than later 100 times out of 100. But, a sports organization always needs to play the "long game" which at times requires you to trade a guy in his prime (say, Phil Kessel) for a few picks (that turn into Tyler Seguin and Dougie Hamilton). This might mean that you lose one of your better players but then when you have 2 fantastic young teenagers in exchange, you are playing the long game properly. As I type this, the Stars have completed 28 games of a 48-game season. They have 20 games to go, and this morning they wake up in the 10th spot, just 1 point behind the holder of the 8th and final playoff position, San Jose. Of course, had they lost to Calgary last night, they would have spent this morning in the 14th spot, an indication of how insanely close everything is in the Western Conference for another year in a row. They are so close to getting in the tournament, and yet, they are a team that has to remain realistic to itself since they were "so close" in 2011 and missed on the final day, and "so close" in 2012 and faded late as well. Each time they fade late, they miss an opportunity to try to flip assets at the deadline and help their future. But, they also have a fan-base that is anxious. The possibility of a 5-year playoff drought is a difficult milestone to swallow. The Ducks have never had more than a 3-year absence from post-season play and the Sharks have had 5 years COMBINED of missing the playoffs in their 21-year franchise history. The Coyotes had a 6-year run of missing the playoffs from '03 to '09, until you helped them hire Dave Tippett as their coach. They haven't missed the playoffs since. Tippett, of course, has coached in the NHL 9 seasons and has missed the playoffs just once - the year he was fired in Dallas. And then there is the Kings. The Kings also had a 6-year absence from post-season play from '03-'09, but then they have ruined it for anyone looking to dismiss one's playoff chances as they squeezed in last season to the final playoff spot and then hauled off and won their first Stanley Cup as an 8-seed. And now, they will be cited by each and every person that wants to keep the "go for it" posture moving forward. "The 2012 Kings got in and won it all!" - why can't we? Of course, that is why with 20 games to go you are in a tough spot. With a possibility of 40 possible points left to fight for, why would you let a 1-point deficit make you pessimistic? On the other hand, do you think you have a similar roster that like the 2012 Kings could just get in and then start mowing down teams with high seeds and by extension, superior talent? April 3rd is the day of Game #36, so you will get 7 more games to determine where you are. Then, with a team that has quite a few useful parts, you would have to decide if you should cash in those parts now or potentially lose them for nothing in a few months as the Stars have their share of expiring contracts. A few weeks ago, they cashed in the expiring deal of Michael Ryder for Erik Cole and that is a move that I have enjoyed. Cole is a power player who flashes every night and while the stats aren't overwhelmingly in his favor at this juncture, I think that was a nice addition for the next two season - especially if they lose Brenden Morrow and their only real net presence on the roster right now to free agency. Derek Roy: We might as well start with the most complicated case of them all. Roy has the potential to be the 2nd-line center that the Stars have been seeking for a while and he does a lot of things really well. He is 29 years old and has done a few things to make this a difficult decision. It appears that the two sides have discussed a contract extension, but also that the two parties are not overly close on their numbers. The Stars have to hold the line at what they think he will be worth and Roy sees some of the numbers around the league and considers himself due for a major extension. He also knows that he might be one of the top centers in free agency and might wish to bet on himself this summer that someone will throw a contract at him for many years (7?) and the possibility of $5m or more per year. If the Stars do that, they have to be confident that he is not in decline - like Buffalo thought when they dealt him - and will still be an exceptional center when he is 35. Is that prudent? Or do the Stars keep shopping for the center ice compliment for Jamie Benn and move Cody Eakin up for the rest of the year, flip Roy for some handsome prospects and keep shopping? I think the Stars would do 5 years at $4m or $4.5 (total deal: $22m or so), but I don't think they want to get in that $35m-$40m range for Roy. And I can't blame them. I might make another run at the player and his agent and see if a compromise can be struck, but if there is no extension before April 3, I think you have to trade him. He would bring you the most in a deal, as the new team would be the favorite to re-sign him moving forward. Brenden Morrow: Another sticky situation, as he has been a fantastic player for you and your captain for many years. But, it seems like his body is not what it was and the $4m price has outlived its value. The great news for the Stars and Morrow here is that he is a very respected veteran that people around the league see as just the type of guy to add at the deadline. His value is actually more in a trade than keeping around and there is reason to believe that you might be able to get something decent. I also think that he would be up for a chance to play deep in to the spring and might welcome a new chapter to his story. I hate to see him go, but I think the time has come and might be a worthy move to make. Eric Nystrom: Not sure how much value he has as a trade, but I do think I would be fine with keeping him around to play that checking-line grit role. You would take calls, but his price is such that he can be a candidate for a new deal for next season this summer. Jaromir Jagr: This one might require a visit with the player and see what he wants to do. He holds all of the cards and perhaps you ask him where his comfort lies. He plays on a year-to-year basis and may be interested in another Cup run, but I honestly have no idea if he wants to stay here and maybe even consider another season in Dallas or if he wants to move. He hides his cards well, but if he wants to be dealt, you might be pleased with a reasonable return, as well. Those are the 4 expiring free agents on the roster (and Jordie Benn). There are a few other parts that you could see gathering interest around the league that would have additional years left on their deals. Those names would include Vernon Fiddler and Stephane Robidas. Robidas, like Morrow, has a no-trade clause, but also like Morrow might welcome a chance to go play for a contender. Personally, I think I would like to open up a defense spot moving forward anyway, and with Robidas, Trevor Daley, Alex Goligoski, and Aaron Rome all on long-term deals, with Brenden Dillon and Jamie Oleksiak securing spots as regulars, you actually don't have a ton of flexibility in the area of your roster that needs the most improvement. If everyone has nailed down a spot, you might need to move something out before you start moving things in over the summer. And I trust that is part of their long term plan - if not priority #1 - to find a defenseman or two that can be in the top spots as 25 minute guys moving forward. They have improved their spot with plenty of youth on the roster over last year's squad, but this is a work in progress. That is why to fall in love with a low-payoff opportunity in 2013 is missing a chance at a brighter future. Tough decisions are heading this way and with 15 days to go, the war-room is full of activity. The most important news items for the Dallas Stars between now and April 3rd may or may not have anything to do with their games. Let's pull up a chair and see what they reveal about their plans and their belief in where they are in all of this. In 2005, there was a controversial moment in the Cowboys war-room. Most people who were there that day will verify that there was a disagreement with what the Cowboys would do with the first of their 2 1st Round picks. Because of the trade in 2004 that pushed the Cowboys out of the 1st Round (Steven Jackson) and back into the 2nd (Julius Jones) so that the Bills could take JP Losman, they had an extra pick in 2005. They would have picks #11 and picks #20 in the 1st round of 2005. They would use these picks and many other resources to covert their defense that off-season over to a 3-4 and they needed many of the pieces that would be required to do what Bill Parcells was hoping to pull off. The disagreement centered around #11. With the Cowboys on the clock, we understand that Parcells was ready to take Marcus Spears or Shawne Merriman at that pick. But, the other side of the disagreement was being handled by Jerry Jones himself. His side, one which had the scouting department in full support, thought it was time to hop on the defensive end from Troy, DeMarcus Ware. They had some feelings about Merriman and his agent and while Spears might not make it to #20, Ware was the best player with the least amount of question marks. We can document and discuss the issues with Jerry Jones and his multitude of strikeouts, but let us never forget the home-run of over-ruling Parcells on the 3-pick choice of 2005. Ware or Spears or Merriman. The only right answer is Ware and witnesses agree that Jones made that call. Since then, Ware has been the most dominant pass rusher in the NFL. 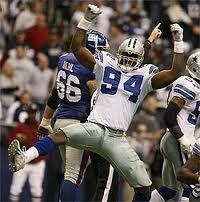 From 2005 to this moment, Ware has 111 sacks which ranks #1 in the NFL. In fact, Ware and Jared Allen (108 sacks) are miles beyond anyone else in this category - Julius Peppers (81.5). But, he is more than a simple pass rusher, because no other defensive front-7 guy has forced more fumbles than Ware over that span, too. His 32 forced fumbles trail only CB Charles Tillman for players at any position. He has played 16 games every year, he has been a model citizen, and he has been the dominant defensive player in the entire NFL since 2005 - a span of 8 full seasons. In short, if ever there has been a no-brainer candidate for the Cowboys Ring of Honor and Canton, Ohio on a team that did not win Super Bowls, it would have to start with DeMarcus Ware. Wow. Just the thing I have been thinking about. What would be the Cowboys quickest route to rebuilding a team that is now both old and expensive, yet, nearly blasphemous to even suggest. What is the case for trading the Cowboys most valuable asset? Let's start with the fact that he is about to turn 31 before he plays another down for the Cowboys. Somethings age well, football stars are generally not one of them. There is still plenty of proof that Ware can have some fantastic seasons ahead, though. Why? History tells us that pass rushers can have great careers past 31. Bruce Smith had 94 sacks after his 31st birthday. Reggie White, who was 31 when he signed in Green Bay, still had 74 more sacks after his 31st birthday. Kevin Greene had 87.5 sacks after that birthday, too. Chris Doleman had 74.5 starting with the season after turning 31. Even Michael Strahan had 57 sacks beyond age 31. There is plenty of reason to believe, based on looking at the 5 best sackers of all-time that you can still do plenty of damage after the age of 31. Running backs don't age well, but apparently there is still a lot of miles left for the elite guys at getting to the QB if they stay in great shape. And Ware appears to be one of those for sure. And if he puts up numbers like those 5 players, he will jump a few of them and make a run at the Bruce Smith's all-time number of 200. He needs 89 more sacks. And, if you were so inclined to trade one of the best Cowboys of all-time, that prior paragraph tells you that the haul would be pretty strong. But, the Cowboys are never inclined to trade players off its roster. The past 20 years, in the post-Jimmy Johnson era, have shown us that the Cowboys have gone that entire span without trading a player for a 1st, 2nd, OR 3rd round pick. Sure, they flipped Jason Ferguson for a 6th, and Anthony Fasano with Akin Ayodele for a 4th, but they never trade premium players for premium picks all the way back to the Steve Walsh trade (and Herschel, of course). This has led to many around the NFL feeling that the Cowboys "Fall in love with their players" as much as anyone in the sport. That label means keeping guys around until they can no longer play in the league, while paying them top salaries and keeping the band together. It is the opposite of letting Ronnie Lott and Joe Montana finish their careers elsewhere. It is keeping the core of Tony Romo, Ware, Jason Witten, Jay Ratliff, and Miles Austin - the group all acquired during the Parcells-Era - together until they all have aged out of their primes. So, each year, as these players all age, their cap numbers cause issues and the Cowboys have to restructure everyone just to become compliant with the salary cap, let alone to make room to actually sign anyone. This is the equivalent of opening a new credit card and transferring your balances, rather than actually paying off your balance. It delays your debt (and often, makes it grow). DeMarcus Ware is the one guy who might be able to fix everything. With a cap hit in 2013 of $8 million, he seems to be paid about right. But, because of the accounting issues that always haunt this team, his number rises to an insane $16m in 2014 and $17.5m in 2015. After that, it drops back to $14m in 2016 and 2017, neither of which carry guaranteed money - yet. He is guaranteed about $17 million more on his current arrangement according to my information (including his money this year). But, I think we all know how this normally goes. Ware has a normal Ware year, and next winter, the Cowboys must extend his deal to ease up the hit in 2014, and in exchange, either add years or guarantee salary in '16 or '17, thus continuing the conveyor belt way of doing business. Or, you could see about a trade. (I pause for everyone to gather up their rotten vegetables to throw at the computer). Would you trade DeMarcus Ware? And if so, what would you get? Percy Harvin to Seattle - for a 1st, 3rd and 7th. Carson Palmer to Oakland - for a 1st and 2nd. Alex Smith to Kansas City - for a 2nd and a conditional 2nd. Robert Griffin to Washington - for 3 1st Rounders and a 2nd. Julio Jones to Atlanta - for 2 1sts, a 2nd, and 2 4ths. Kevin Kolb to Arizona - for a 2nd and Dominque Rodgers-Cromartie. Richard Seymour to Oakland - for a 1st. Jared Allen to Minnesota - for a 1st and 2 3rds. Matt Cassel and Mike Vrabel to Chiefs - for a 2nd. Roy Williams (and a 7th) to the Cowboys - for a 1st, 3rd, and 6th. Some of these trades relate and some clearly don't. Quarterbacks have to be treated in their own category as people are always willing to overpay for a QB. Jared Allen's deal was when he was 26, but also when he had a reputation of being a bit of trouble off the field. Could you get a 1st and a 2nd? It seems like a fair offer that only relies on 1 team wanting to spend the picks to get a generational (Reggie White to Green Bay?) type acquisition and then sign him to a 5-year deal that would replace/restructure his current one that both parties would agree to. Would Ware accept a 5-year, $60 million deal with $25-$30m guaranteed right now to begin his career elsewhere? I think he would be delighted to nearly double his guaranteed money. Would the Cowboys trade their most valuable non-QB asset for a 1st and a 2nd rounder, thus getting a return on a player who has premium value rather than letting him age to where you would simply have to cut him for nothing down the road? I don't think they would consider it, but should they? Well, if they were to think of it, they shouldn't have restructured his deal. Once they did that a few weeks ago, they actually would have a bigger cap hit to trade him. It would cost them to clear him out of here - thus even further weakening their 2013 squad. Then, any room Romo would give them by extending his deal would just go to make a Ware trade possible. And this fact further speaks to the corner the Cowboys continue to paint themselves into. So, there, Dave. It is a reasonable idea and actually one that I hope they considered. A 1st and a 2nd Round pick to sacrifice one of your most valuable players in the name of building this team around players in their primes moving forward. It would be forward thinking to say goodbye a year too early rather than a year too late. You then have multiple picks in each of the first few rounds, surrounding other elite young talent like Sean Lee, Dez Bryant, Tyron Smith, and Bruce Carter, with other kids who are on rookie deals. Could you get Chance Warmack and Sylvester Williams in the 1st? Could you get 2 more studs in the 2nd to fill out safety and maybe more offensive line? And how does this change your future? Instead, Jones and his crew march bravely into the 2013 season knowing that this is the best move for today, but tomorrow might require a real bottoming-out sequence in the future to pay the debtors all of this money that is being charged up right now. It would never happen. But, it is worth addressing in this edition of the email bag. To steal a phrase from Game of Thrones as it pertains to the Cowboys cap strategy, "Winter Is Coming". They know it. And they march on. And now, a little something about Chester Marcol and me. This following trip down memory lane and how sports has changed for me since I was a boy has nothing to do with the Dallas sports scene at all. I have been a sports junkie my entire life. The short explanation is that I was born this way, with the slightly longer explanation being that my parents closely monitored the media intake of their children for various religious reasons and therefore unknowingly pushed me into sports. That was because their idea to limit the amount of television we consumed at an early age did not include sports. But it did include nearly everything else. As early as I can recall, the television had a massive set of restrictions on it, but none of those included watching men play games in uniforms as they represented certain arbitrary geographical locations that they may or may not have any regard for beyond a paycheck twice a month. This loophole in the restrictions over the magic box had this young boy, even as early as 5 or 6 years old, looking forward to games that might be on television. Like I said, I have no idea which came first here, the chicken or the egg. Was the sports interesting to me or was it simply something moving on that screen? If, for instance, the loophole in my household rules was cooking shows, might I have turned into a chef or restaurant critic? I don't know. Regardless, as I sit here at 40 years old, I only know the world through a lens of sports. I follow closely a number of leagues in a number of sports on a number of continents. There is almost no mens sport that I don't follow at some level. On weekends, I will often watch 3 games in a day in 3 different sports. And it doesn't even seem weird to me. Part of this only existence I have ever known is to document as much of it as possible. That explains my enjoyment of writing on blogs like this, but it also explains the contents of my closets at my house. In one, you will find sports-pages from things I have found to be relevant at one point of my life. In another, a sports card collection that is huge, but has gone largely untouched since about 1990. As a kid growing up, I was once sure that I would never grow tired of collecting and sorting cards, but then again, I am sure most kids feel that way about things they do and how they might feel about them in the future. But, then, there are about 12 boxes that my wife hates that have been with us since we were married in 1995. These boxes have been moved from place to place as our lives have progressed, and she knows that battling me on this is simply a bridge too far. It is my video tape collection. Hundreds of VHS tapes that captured every sporting event I could think of from 1986 (the year of my family's first VCR) until my transition to recordable DVDs in about 2005. Incidentally, I still have the problem - not as bad as it used to be, but I still have it - of keeping events that I deem worthy and saving them for reviewing down the road. This re-watching of old sporting events is seldom ever executed as my schedule is very full these days, but I still do it. I keep them all. I am a sports hoarder. In recent years, I have become a bit more educated in the ability for modern technology to both save the VHS tapes from age and deterioration and also to fit hundreds of hours of video onto a simple external hard drive that would allow your digitized files to last for a long time until another technological creation renders that idea antiquated. By simply digitizing your tapes, you can now move them around your computers with ease and take the tapes to the trash. If nothing else, you can rest easy that the 1988 NCAA Final Four is preserved for future generations that won't watch it either and also you can free up the guest room closet so that your mother in law can hang her clothes when she stays with the family. Digitizing happens in real time, so if you have 500 tapes and they each hold 6 hours of sports, you can imagine how long it might take to go the entire journey, but I chip away at a pace of about 1 tape a day. Hit record on the computer, play on the VCR (I actually had to find a new VCR) and walk away for a while. But, slowly the the pile of tapes to be converted shrinks as the pile of tapes to be disposed grows. It is a lot of stuff. Every single NBA Finals from 1987 until 1998. All of the Final Fours in that span. Every Green Bay Packers win from 1986 until the present day. College football. Super Bowls. Drafts. Hockey games going back all the way to Lake Placid. And on and on and on. Heck, since moving to Dallas and covering the Cowboys, I have a Cowboys video library that could rival many with games going all the way back to the 1960s. Oh yes, I am beyond arguing whether this makes me sick. I know it does. And yet, I continue looking for games that I don't have. One of my favorite things to do is to retrace the steps of the games I have attended in my childhood. To find video tapes of the games I have been at is something I will often do with likeminded sports nerds online. We all need hobbies, right? Some people keep ticket stubs, well I want a 3 hour video file of the game I was at that meant something to me. Anyway, I said all of that to bring this up. Recently, I acquired a game on video that I converted last night onto my hard-drive. The reason it is noteworthy to me is that it represents my very first sports memory of a play "I would never forget". I have no idea how our memories work and I don't know why our memory decides to earmark certain moments with "do not delete". I know I had watched sports for several years before this moment happened and I also know that I could recall things all the way back to 1977 when I was 5. 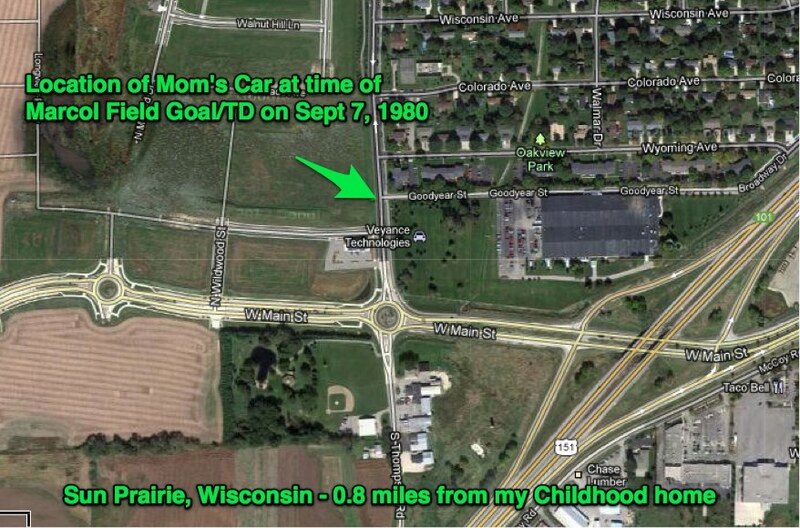 But, in 1980 - September 7th, 1980, in particular - was the first time I lost my mind on a sports moment. It was a moment that my mind engraved and was referenced 100 times with my friends the rest of our childhood. You have to remember: back then, we didn't have recording devices on our televisions. We certainly didn't have a way to see these moments again - and I didn't have cable until I went to college in 1990. If you missed the game, you watched the news that day. If it was just a regular game, you may never see it again. So when a collector I knew sent me a copy of this game, I was very excited that the 8-year old version of me would now be able to watch what his memory had preserved for over 30 years. My house was not filled with Packers' fanatics. I think my dad was fine with them, but like most things at the time, I pretty much remember his loathing of them more than his actual enjoyment of their product. Perhaps he hoped for a return of the Lombardi-era dominance, but it seemed like a fall past-time to complain about how utterly awful they were. And they really were. There are tons of pictures of me as a child wearing Packers gear. Really young pictures where a boy has no ability to pick his own clothing. So somehow, without fanatics for parents, they still steered me to a team that was lousy my entire childhood. From the year I was born (1972) until my senior year in high school, they never won more than 8 games in a season. Think about that. During the same span, the Cowboys won 10 games or more on 10 different occasions. We stunk. And I didn't care, because I had this weird unconditional love for them. Anyway, back to Week 1 of 1980. This year would turn out another 5-10-1 season by the time it ended, but for some reason, everyone was really looking forward to 1980. Perhaps because our QB, Lynn Dickey, was returning after another broken leg, everyone felt like maybe they could accomplish something under head coach Bart Starr. Well, they were wrong. Starr coached the Packers for 8 years, and they were all bad seasons. They wasted James Lofton's prime and never came close to getting anywhere except in the 1982 strike shortened year. The entire NFL was a farce that year, playing just 9 games, and the Packers did make the farcical playoffs that year, which would be the only playoff appearance of my life before Brett Favre came along and put them in in 1993. This Week 1 game in 1980 was against the Chicago Bears and their slightly-less ridiculous run of form between George Halas retiring in 1967 and Mike Ditka being hired in 1982. Mike Phipps and Dickey squared off in a match-up of Quarterbacks that resulted in 4 interceptions and 0 touchdowns on the day. Lambeau Field was filled with optimistic fans who had no reason for optimism as a poorly played game of football lasted all afternoon. The game went into overtime and this is where my memory takes over. I believe I was watching the game for most of the day, but as the game went late, my mom made me go with her to the store (as 8 year olds often must do). We were driving north at precisely this moment when Chester Marcol, the Green Bay kicker, scored an unlikely overtime touchdown after his blocked field goal attempt flew right back into his arms. I have no idea what mom needed at the store that couldn't wait until the Bears-Packers game was over, but she couldn't wait. I remember lining up for a field goal in overtime and waiting for Jim Irwin to call the play on the Packers Radio Network with Max McGee. Honestly, I don't think the call was able to convey to little me what was happening, and hopefully, you will understand why on the the video below. It was truly a wild play and really amazing that a kicker in glasses could run that far without being tackled. It is funny to look at a moment that your memory held tight but that you can't totally recall precisely. Marcol actually seemed to have decent wheels around the corner and then was mobbed in a stadium that went out of its mind. The Packers would ride the momentum of this amazing moment and lose their next 3 games and have another disastrous season. They would lose to this same Bears team in December at Soldiers Field by the score of 61-7. That game also has significance in my life, because that was the game where I called the Sportsline (900-976-1313) that ran those score update commercials to basically see if they would have the score updated even though I was watching the game. I called a total of 11 times during the game and when the phone bill arrived I found out that my parents would notice the $0.99 charge that each call billed, explaining why they thought you should get your parent's permission before calling. Anyway, if someone would ever ask what is your first happy Packers memory, it would surely be this play. And now, even though the quality is far from HD, I have the entire game on my external hard drive for future non-viewing (there is no way I would sit through that 3 hours of awful football with that awful picture). But, it was fun to see the play that my memory has held on to all over again. A similar play - say the Tony Romo hold in Seattle in 2006 - has played a billion times on tv since it happened. But, in 1980, you either saw it live or you didn't see it. Especially if your team was 5-10-1 that year. I didn't care then and Chester still has a place in my heart all of these years later. As the Cowboys sit out the free agent season so far, it is time to reflect on the fact that a few former Cowboys have found employment elsewhere. In fact, one former Cowboy player in particular represents one of the last traces to the 2009 draft, as John Phillips has signed to play for the next 3 years in San Diego. The 2009 draft, a term that is a gut punch to most Cowboys fans, as it represents part of the giant hole in the roster that should be constituted of 25 and 26-year olds, like Phillips, who would be doing much of the heavy lifting for an organization. Players who you would be fighting to retain and pay for the prime of their careers from ages 26-30. This, of course, is one of the maddening facts about the Cowboys roster. One has a fantastic collection of players who are over 30 - one of the best in the league, actually - and a fine collection of players who are from the 2010-2012 drafts, too. But, those years at the end of the last decade have caused the Cowboys to struggle on the field and then have to overpay players in their 30s to squeeze every last ounce of their abilities out before they retire. There is that staggering gap in the Cowboys roster. Much can be traced to the 2009 draft and the Roy Williams trade that preceded it. People often ask, "why can't you let that go?" They want to know why you beat a dead horse. Why do you still talk about a trade from 5 seasons ago? Simple. Trades that happen 5 years ago have a profound impact on what you are able to do in 2013 and 2014. Why? Because, those picks that you give away in 2008 for the 2009 draft should be the heart and soul of your team in 2013. And it if isn't? Then, you have cap issues and holes on your roster that you cannot afford to fix. In general, the 2009 draft isn't very good. There are a few teams that found significant upgrades in that draft - for instance, Green Bay grabbed BJ Raji, Clay Matthews, and TJ Lang in their 1st 3 picks, Philadelphia found Jeremy Maclin and LeSean McCoy with their top 2 selections - but, for the most part, '09 will not go down in the history books as one of the ripest orchards for talent. That being said, the Cowboys lack of production from their picks is shockingly sad. Here are the 12 picks and beside their names, fine the career snaps in which they lined up as Cowboys. TOTAL. And now the book is fully closed on the entire 2009 draft, assuming Victor Butler isn't retained which is highly unlikely. A grand total of 1,935 snaps were taken by 12 draft picks in the entire careers here in Dallas. As a comparison, the 2012 class is already at 1,582 snaps in just 1 season. And even that number needs to be higher. But, the signs are there that you might have 4 starters from 2012 when it all shakes out. 2009? There was never 1 starter for even 1 moment that wasn't an emergency fill-in for injury. Just know that each game has about 60-65 snaps from scrimmage on both sides of the ball. With 11 players on each side of the ball, that is about 660 snaps per game that has to be filled - or 10,560 per season for the offense and another 10,560 on average for the defense. If you need 21,120 snaps to be taken by your team each year, you better get more than 1,935 from an entire draft class for their entire career. One stat that might hurt is that a regular from that draft - Clay Matthews (one of several players that were available to the Cowboys if they held their pick #20 instead of Detroit) has played 3,957 regular season snaps since that draft by himself. Also, please don't blame the entire 2009 draft disaster on the Roy Williams trade. The Cowboys twice traded back to "accumulate picks" and each time they found nothing. They were at #51 and decided to trade back for #75 (Robert Brewster) and #110 (Victor Butler). Players taken from #51-#58 include Andy Levitre, LeSean McCoy, Phil Loadholt, William Moore, Paul Kruger, and Sebastian Vollmer. Or, in other words, most all of the top free agents in this free agency season. Then, at #117, they bolted back for #120 (Brandon Williams) and #229 (Manuel Johnson). They also traded up with picks #155 and #213 to go get #143. They found a guy they wanted in DeAngelo Smith who never played a snap with the team. You certainly hate to waste 2 picks on a guy who doesn't even make your team for one week. His claim to fame as my friend Todd Archer recalls was that he was the guy that David Buehler beat in the 40 yard dash at training camp. Anytime your kicker beats a DB in a race means you have a fast kicker or a slow defensive back...or both. The book is closed on the 2009 draft. They will be remembered for 2 things - their heroic efforts in dragging many men to safety in the infamous practice facility collapse in May of 2009 at their initial rookie camp and being part of a draft class that sadly did not amount to much of anything on the roster for years to come. Phillips was a blocking tight end and Victor Butler a rarely used situational pass rusher. McGee was a project QB who never developed properly. The rest never even made a dent at all. And now, the roster has voids. Too many to fill. That is why the dead horse continues to be beaten. 2008 has 1 survivor in Orlando Scandrick and 2010 is down to 3. So, from 2008-2010, with 24 selections, the Cowboys retain 4 players total from a group that should be between 24-27 years old or the prime of a franchise. This is why we emphasize the draft in this space. It is the very life-blood of a franchise. Or the death of it. There is much rejoicing in the Dallas Stars front office this week as the NHL has all but rubber-stamped the news that the NHL as we currently know it is going to morph into an all-new and improved alignment and suddenly the Stars will compete in their own time-zone on a more regular basis. This is going to be thoroughly promoted and sold to you as a fantastic way to spend your weeknights in the future - with games starting at 7:30 instead of 9:30. My first reaction is to rejoice, but not for the conventional reasons that are being sold. In this time-shifting universe many of us live in, where our kids (and their sports and their events) and family cause us to delay the puck drop until their bedtime, anyway, this will not cause a major difference on how many of us consume hockey. Of course, not everyone rolls that way, so I am sure there is some impact with having 4-6 Pacific time zone starts instead of 12-14, but I don't want to list that as a top reason for me. No, for me, this comes down to specific dates as to why realignment had to happen and it has nothing to do with time zones or start times. Those dates are: January 26, 2007 and November 3, 2010. Those 2 dates to me are everything that is wrong with my National Hockey League. It is what makes me internally scream at the mere mention of Gary Bettman trying to "grow the game" and see this league succeed outside of the northeast corridor. For those are the two times in the 8-year career of Sidney Crosby in which he has actually played a hockey game in Dallas, Texas. Now in fairness to Bettman, Crosby missed two other stops due to injury. But if you have been a loyal NHL fan who has purchased tickets since 2005 when Crosby has entered the league, you have seen the Phoenix Coyotes in person 26 times and Crosby, twice. Conversely, in the slightly longer career of LeBron James, the NBA equivalent of Crosby, James has played 10 times in 10 years in the same arena (not including his glorious collapse in the playoffs in Dallas in 2011). Why? Because in the NBA, they have always promised its fans that every year, every team will come to your seats. If you buy a season ticket, you will get a chance to see every player and every uniform come to you. It will be a rare opportunity to set your eyes on Magic Johnson or Larry Bird or Michael Jordan. But, in the NHL? Where the moments are far more rare when a rockstar presence comes along that could set your city on its ear by hearing that "he is here", they have not made this happen in years during Bettman's run. All of this talk about marketing our stars and growing the game has not really hit home when they give us the Coyotes again. Meanwhile, the teams in the Northeast are fed a constant diet of Flyers, Penguins, and Rangers. Hard to believe that their arenas are always full, right? And finally, it is happening. Every team - and hopefully every dark colored jersey - will be visiting Dallas in 2013-14. This means way more to me than changing divisions or time zone consideration, and if they would have just done this, I might have been more open to keeping the divisions the same. But, to get it all at the same time is just too awesome to consider. I also don't want to discount the other item that is being referenced, but not actually said out loud. And that is the idea of getting back in the midwest means that the divisional rivals are all healthy and obsessed fan bases with legions of fans that will cause a domino effect more-so here in Dallas. I think the Sharks and Kings, in particular, have strong fans in the Pacific Division. But, there was never a moment when a game in Dallas was going to be over-run with visiting fans inside the division. Well, anyone who follows the Stars knows that this can and will happen with great routine unless Dallas does something about it from now on. When you are in a division with Chicago and St Louis, you better know that if you don't sell out your barn, they will help do it for you and turn your home game into theirs in short order. This has a great effect on the home base and gets the pulse pumping for the home side and soon, it re-energizes your own dormant fan-base by getting them to activate rather than having their home over-run. That is how a true rivalry works. When they have fans that live in your city and you have fans that live in theirs, too. That can't happen with California and Arizona - as allegiances don't run deep, but it can and will happen now. And sharing a division with Minnesota and Colorado, too? Sign me up. As you can see, I am really into this realignment issue, but it has more to do with seeing the whole league and organizing the divisions to get some hated rivals back in play that drive me far more than late-night hockey. Although, I will concede that last Thursday's game that ended well after midnight reminded me that some people have to get up early in the morning and are likely missing out on this gold. And that will happen less, too. You wanna know how to get Capone? They pull a knife, you pull a gun. He sends one of yours to the hospital, you send one of his to the morgue. *That's* the *Chicago* way! And that's how you get Capone. Now do you want to do that? Are you ready to do that? Meanwhile, there was another moment in a game at Phoenix on Saturday night that made me think of the movie, the Untouchables, and the above quote from Sean Connery's character, Jim Malone speaking to Kevin Costner's Elliot Ness. This moment, of course, was when Martin Hanzal tried to separate Jamie Benn's head from his shoulders with a monster hit across the jaw from the blindside after the puck was long gone late in the 3rd period. Benn wobbled to the bench and was done for the night and given that Shane Doan nailed Benn hard last March with an illegal elbow that cost him 3 games and given that Hanzal was suspended last May for boarding Dustin Brown, I figured a suspension would be coming to Hanzal for that absurd hit. But, I figured wrong as the league decided that there was no penalty or suspension due to Hanzal for his hit on Benn. Which, of course, infuriates anyone who wants to see Benn on the ice and makes me think of the Untouchables. It makes me think about how I was raised in following the NHL and knowing the silliness of waiting for the league office to take issue with your opponents and telling them to behave. That has never worked in the NHL and it never will. And while there is a group of people in the NHL that doesn't think that brute force and strength is the best deterrent for this nonsense, I will continue to disagree with some level of strenuousness. You want to send a message to Phoenix quickly and swiftly that this will not be tolerated and that there will be an enormous toll to pay from now on when they take borderline liberties with your best player. You don't wait for the league to do it for you. That is why I was disappointed that nothing much was done right at the moment in making Hanzal defend himself against knuckle sandwiches. Of course, the players on the ice were not the people to do that and Derian Hatcher is not walking through that door. But, that is the 2nd time in less than a year that those guys have knocked Jamie Benn out of a game, and that cannot be tolerated. You just spent a ton of money on him and made him your cornerstone, and he already has a nice list of concussions being built. He has proven he will stand up for himself, but you need a angry swarm of bees when someone goes after the hive. Swift and immediate vigilante justice must be served up, and worry about the league hitting you with a rolled up newspaper later. That is the only message Phoenix will understand and it must be sent quickly. Waiting for a suspension and for the league to step in is a pointless exercise that will cost your key players plenty of time on the injured list. The best defense for hits like this is to let the league know that your team will not tolerate them in any way, shape, or form. That, as Sean Connery might say, is "the Chicago way" - which is ironic, given the Blackhawks style these days. Keeping with the theme above, this is not so much a great fight as it is a great example of a player going to stick up for a team-mate who is a victim of a hit that they didn't care for. But, you go make the opponent accountable for what he just did to your guy. Credit to Patrick Wiercioch of Ottawa. 9 of the next 11 are home for the Stars. They need to hit the afterburners starting tonight against Nashville. If on April 1 they are not sitting pretty, then it is doubtful that 2013 will be a playoff year. They simply must shoot for 16 points out of the next 11 games. That won't be easy, but then again, it never is.